Last weekend I returned to the US for a long weekend to attend a wedding, and while crammed in a sardine can of an airplane for a pair of 13-hour flights (thank you American Airlines...not) I had a chance to reflect on the first half of 2013. I am not one to make New Year's resolutions typically, but 2013 was an exceptional year. As the ball was dropping in New York City / Boshingak bell was being rung in Seoul, I had decided that I wanted to see more of this country that I now inhabit. In my first 8 months here I had been a very bad Korean tourist, having done little outside the capital city (besides where Samsung sent us during our orientation). As Seoul is absolutely massive there are always things to find here, and I had set my eye on other travel around Asia, taking two holiday trips to China and three to Japan. But I didn't want to one day leave here without seeing the rest of my adopted country. South Korea isn't that big, after all (it's about the size of the US state of Virginia), and being rather low on Samsung vacation days made in-country weekend travel far more appealing. One of my college roommates was in town, as he is married to a Korean lady nowadays. Turns out that her brother is the star player on the Daejeon team in Korea's professional volleyball league, so she invited me to join my old roommate and her family for a day trip to Daejeon to watch the team play. Daejeon is about a two-hour drive south of Seoul and despite being the 5th largest city in Korea is known for absolutely nothing (when I asked my Korean hosts this question, they paused for a long moment, struggling for an answer, and finally blurted "...the Expo??"). The drive through town past a series of monochromatic concrete buildings confirmed Daejeon's drabness. However, Daejeon has a fantastic volleyball team, sponsored by Samsung of course, and I had prime seats in the "VIP" section for game 1 of the Korean mens' professional volleyball championship series! Volleyball in Korea, I discovered, was awesome. Cheerleaders, chants, special cheering sections for the star players (one of which pulled off this amazingly coordinated card trick during a timeout), pyrotechnics, and insanely dedicated fans who did nothing but yell for two hours straight. Closest thing in America to this atmosphere would be a high-school basketball gymnasium. I loved it. The Daejeon Samsung Bluefangs won and I had discovered a new favorite professional sport in Korea. My Korean hosts were super kind as well and I really appreciated their generosity. 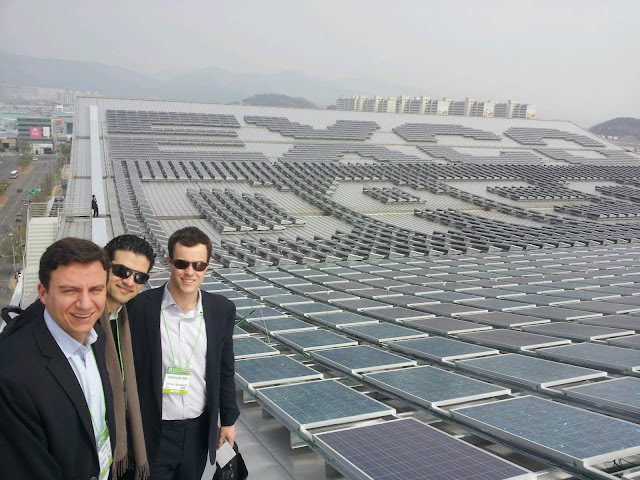 This trip was quasi-work-related – a couple colleagues and I were heading to Daegu for its annual Green Energy Expo. Never mind that Samsung has shut down its renewable energy development business completely, or that most of the presentations would be given in Korean. So it was a bit of boondoggle, but we had nothing else to do really as we were on "beach week" between projects at work. 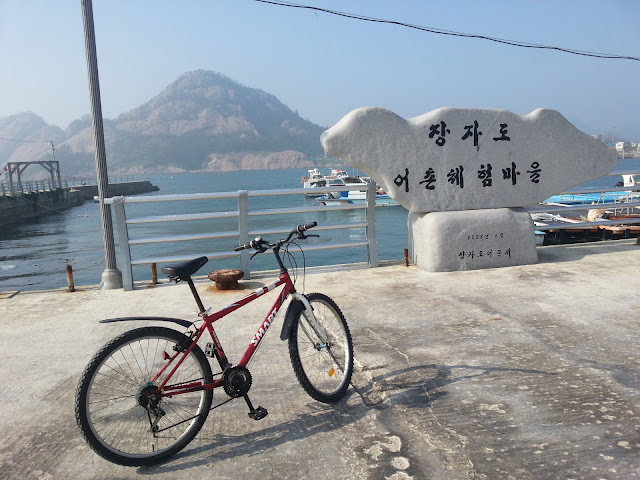 This was also courtesy of another work field-trip boondoggle to the Samsung Heavy Industries shipyard on Geoje Island. A massive facility and very impressive. Geoje Island is along the southeastern coast near Busan, Korea's 2nd city, so a colleague and I found a hotel room and stayed over in the city for Friday night. I really liked Busan. The air was cleaner than Seoul and the vibe was a lot more relaxed. 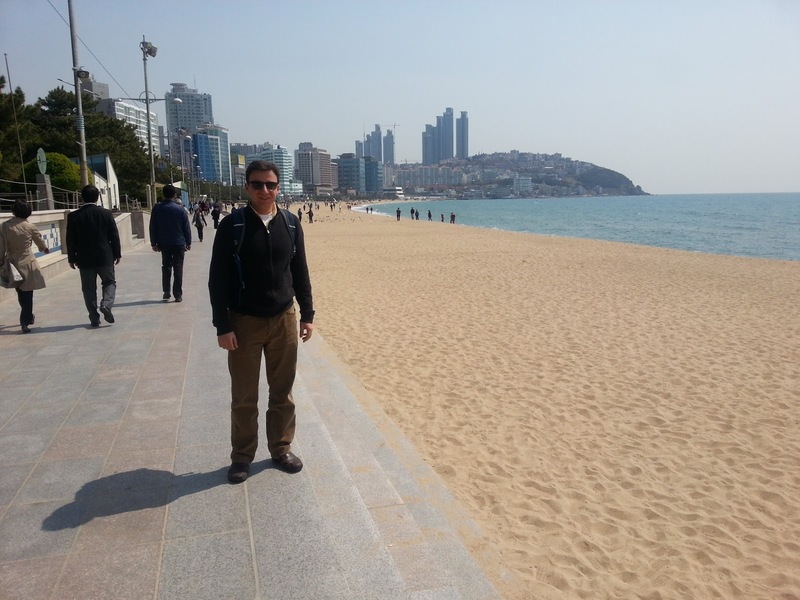 Also Busan has a very nice beach, the most popular in Korea I am told, and a defined skyline unlike Seoul. My colleague and I ate at a nice sashimi place along the beach for dinner, and though Korean sashimi is dull compared with its Japanese counterpart my colleague and I had a grand time mixing our fish with the many side dishes and, of course, soju. The nightlife scene near the beach is fun too. I would definitely revisit Busan. Haeundae Beach. This place will be mobbed during the summer months. I covered this trip to the border between the two Koreas in another post. I definitely want to revisit to see the Joint Security Area. I booked this trip rather last minute with a travel group that specializes in providing adventures to Korea's many English-language teachers. While I felt rather out of place as someone who is building an actual career in this country (and not just here on a one-year joy stint), I was glad to tag along to see another part of the country which I hadn't seen before...the "West Sea" between Korea and China (also known as the Yellow Sea). In Seoul I boarded a 3-hour bus for Gunsan, an industrial town on the western coast, then rode a 45-minute ferry to Seonyudo Island (which is also the name of an island closer to Seoul). We rented bicycles and rode around on a beautiful mild spring day. The atmosphere was peaceful around the little fishing villages that dotted the island. There was also a beach here and we were the only foreigners in the area, the others were mostly Korean families and groups of Korean middle-aged men and women who had come to get drunk together on the beach while watching the sunset. We shot off bottle rockets and went searching for clams. A nice weekend escape from the city life. May 17 was Buddha's Birthday on the lunar calendar this year, which fell very conveniently on a Friday so we received a long weekend! 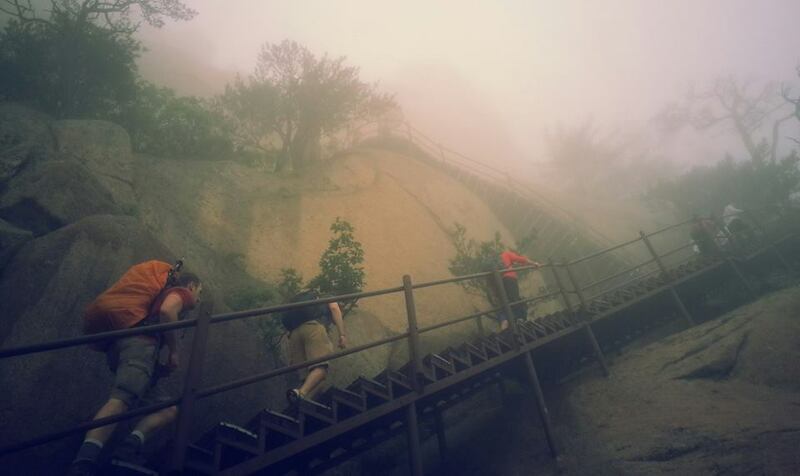 A group of Samsung foreigners had organized a temple stay in the Jiri mountains on the southern part of the peninsula. It was a beautiful area – big lush green mountains and winding roads through the valleys. I was reminded a bit of my trip to the Alps a long time ago. Getting to this beautiful landscape was a nightmare though. Traffic in Korea is legendarily bad on holidays and we spent 6.5 hours on a bus for a trip that should have taken only 4. The temple stay itself is quite the cultural experience. We slept on the floor in rooms with wood-fire heated floors and ate 3 meals a day of vegan bibimbap. Never in my life can I recall being so bored with eating! We were awakened at 3:10am for morning prayer -- stumbling downhill half-asleep in the dark to watch a group of monks chanting in a temple hall is not an experience that I will soon forget. During the day, we picked green tea leaves from the monks' wild garden and laboriously pressed the leaves in a steamy hot room. Though the mountain landscape was amazing, all this work and dull food and lack of sleep left me tired and grumpy. I really needed a 3-day weekend to recover from my 3-day weekend here. I am definitely not cut out for the temple life. On Sunday we visited green tea fields around the town of Hadong and viewed their annual green tea festival. We also visited a cultural center where we learned about the customs associated with a traditional Korean tea ceremony. There were a lot of rules to remember, but the tea was quite good. This trip was inspired an American friend who forwarded me a New York Times article in the winter from the Frugal Traveler blog. Legendary bibimbap? Yes please! In fact, the bibimbap we tried here was quite delicious. I'm not a huge fan of this Korean staple dish, though I do eat it occasionally when I want to feel healthy. It's very simple, just vegetables, meat or an egg, rice, and red pepper gochujang sauce. But at Hanguk Jip in Jeonju, in business since 1952, the bibimbap is yum! Thankfully one of my colleagues has a Korean girlfriend who was able to look up this gem on Naver...this place was quite the treat. I ordered a bibimbap with beef tartare and was delighted with every taste in my mouth. I'm not sure what made it so good, but some combination of the right spices combined with very fresh ingredients. In the evening we went to a couple makgeolli restaurants -- they are hole-in-the-wall places which serve traditional Korean rice wine with a dizzying assortment of side dishes. It's a strange setup – you order the rice wine and they then bring out whatever side dishes that restaurant chooses to serve that day ... food du jour if you will. The food was very Korean (i.e. not everything was tasty) but good cultural experience and absurdly cheap. We drank two kettles of makgeolli and stuffed ourselves with food in two restaurants for under $7/person. The touristy part of town itself is nice and quaint and has a good pedestrian area where you can shop for traditional Korean gift items. We stayed in the city's Hanok Village (traditional Korean houses), and shared a cozy but nice room. Mostly Asian tourists. Not much else to do that was interesting, but certainly a place to visit if you want to be frugal like the NY Times author. 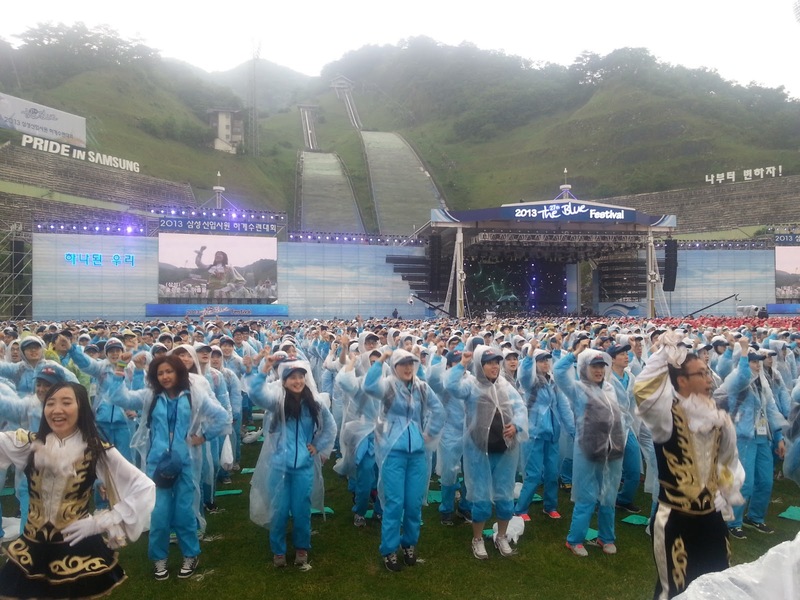 I wasn't here to be a tourist, as Samsung had put its new hires on a bus to this resort town in the central mountains of Korea for the biggest corporate pep rally imaginable. (check out "Samsung summer festival" on YouTube to see what I mean) Beautiful landscape and the town looked quite quaint, like something out of Switzerland. I want to get back here during ski season.